The Big Wobble: Nearly a half of one months rainfall in just one hour causes chaos in Sydney after thunderstorms dumped more than two month's worth of rain on the city. 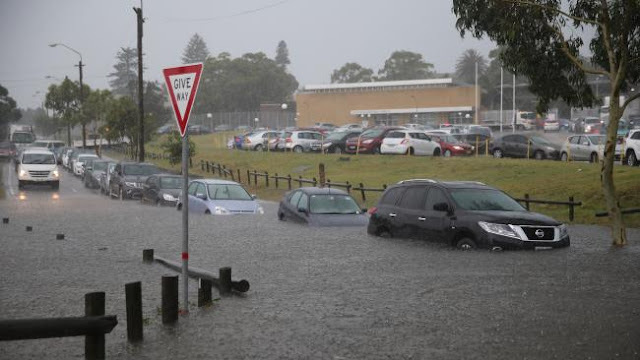 Nearly a half of one months rainfall in just one hour causes chaos in Sydney after thunderstorms dumped more than two month's worth of rain on the city. Sydney has experienced a week of extreme rainfall and flooding after thunderstorms dumped more than two month's worth of rain on the city. In just one hour on Tuesday morning, 48mm of rain fell in Marrickville, 45mm in Canterbury, and 35mm in Sydney's CBD. This equalled the 48mm total that fell in January, with 32mm between 10.30 and 11am today and more than 50mm has fallen since 9am, making it the wettest day in Sydney since August 4 last year. Flooding was reported in Penrith, Parramatta, Wollongong, Campbelltown and Port Kembla, Marrickville, Zetland, Woollahra and Sydney's CBD. The State Emergency Service had to rescue 13 people trapped by floodwaters, mostly in Marrickville and Zetland. An apartment building on Ewart Street in Marrickville was in danger of collapsing after a waterhole next to it filled up with water. Seventeen residents have been evacuated but the threat has since eased and the building will be monitored overnight.